Art Vuolo (pronounced Vo-Low), Jr. is actively involved in radio, television, video production and journalism. He is a 1969 graduate of Eastern Michigan University with a B.S. degree in speech. In his senior year at EMU he developed the concept of RADIOGUIDES designed for people who travel. His company has published over 100 million such guides directing listeners to their favorite programming between 1972 and 2006. He has worked with many of the nation’s most prestigious companies and radio stations. His company, The RADIOGUIDE People, Inc., had a great run of 34 years, but fell victim of a downturn in the economy and the Internet. 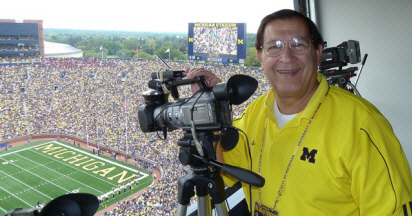 Art first lived in Newark, NJ, spent 11 of his “wonder years” in Indianapolis, IN (where his passion for radio began) and has been a resident of Michigan since August of 1962. He got into radio by assisting the late Jim Shelton who (at that time) was Indiana’s best known radio personality at 1070/WIBC in Indianapolis. With the advent of home video in early 1976, Art was one of the first to purchase a Sony Betamax VCR. In 1981 he was a guest on a dozen radio and TV talk shows regarding the subject and was a columnist for the first home video magazine known as Videophile. In 1979 he took his love of both radio and video and combined them into “Vuolo Video Air-Chex.” They are video field trips into the studios of many of America’s best radio stations for an educational and often very entertaining inside perspective. It is a whole new way to LOOK at radio! His tapes have been featured at countless radio conventions! In 2015 it was announced that Art’s entire video archive will be enshrined into a permeate exhibit, after 2020, in the National Radio Hall of Fame at the Museum of Broadcast Communications in Chicago! Today, he maintains one of, if not the largest, video library in the country of radio-related video. In 1985 Radio & Records called him “Radio’s Best Friend” and he has been known by that moniker ever since. However, the first person to use that “handle” was famous radio programmer and personality Scott Shannon in the early 1980’s. While at WQXI in Atlanta, GA., Fellow DJ John Leader, who today is among the top voice-over talents in the USA, picked up on it and used it while writing the Street Talk column in R&R. Art has written about radio for local newspapers, websites and national trade publications, like: Radio Ink, All Access, Jockline Daily and RAMP. He is married to the work he loves. He has severe workaholic tendencies and seemingly works 25 hours a day, assisting all of those seeking his help. Art lives and works in Novi, MI a northwest suburb of Detroit. He was made a lifetime member of the Ypsilanti Area Jaycees received the prestigious Rockwell Award by The Conclave in 2001, was the final recipient of the Bob Ufer Quarterback Club Yellow Jacket Award and a Lifetime Achievement Award from Talkers Magazine in 2018. He has helped countless people get into the broadcasting business. Art Vuolo, Jr. is a one-man walking campaign for the radio industry who actually believes that honesty, and being nice to people, is still in vogue. This note was written in 2006 by my friend Tom Kent, who is a legendary radio personality and record company executive. He’s worked at some of America’s best stations from WLS in Chicago to KLIF in Dallas and WHBQ in Memphis! It has not been posted as a form of public adoration, but rather because of it’s sincere content. We all like to know that what we do is appreciated and these words touched me deeply. It’s early Sunday morning and I’m killing time on this crazy Internet prior to getting ready for church. I came across Scott Childer’s WLS site. I’m looking at all the pictures… and there I am looking young and cool…and look, it’s Art Vuolo with John Gehron. Suddenly without warning, it hit me like a brick wall…. reality! The river of time continues to move with it’s absolute certainty and along that river are the memories we cherish. I’m thankful this morning for you Art. Whoever coined the phrase “radio’s best friend” absolutely nailed it. You have been there with your camera and your smile for a very long time. I think I speak for the entire radio industry when I say this. You are loved…you are appreciated! Maybe we don’t take the time to say it often enough but it needs to be said and it needs to be said often. Two words my friend. Thank you. Thank you for putting those sign posts along that river of time so we can all take a glimpse back. Without those sign posts, we are doomed to lose our way as we travel down that river. Click here to read Art’s R&R Profile!